The Maracana stadium in Rio de Janeiro is scheduled to host seven games during the upcoming World Cup, including the final game on July 13. If you've ever dreamed of going to the soccer World Cup, now is the time. But brace yourself, this isn't going to be cheap. 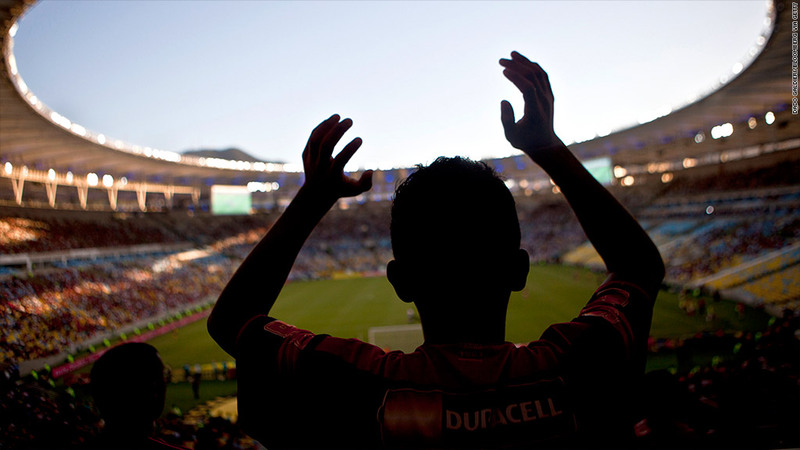 The upcoming FIFA World Cup runs for a month from June 12 in a dozen cities across Brazil. Fans from around the world will flock to the country to cheer on their national teams, party into the night and take in the sights. Those hoping for last minute, budget deals will be disappointed since a wave of World Cup demand has already caused a big spike in air fares and hotel rates. People who booked in advance have already snapped up the bargains. Total costs can vary widely, but a quick trip to see a match or two would set you back about $3,000, including flights, budget hotels, soccer tickets and spending money. If you hope to follow your team all the way to the final on July 13 in Rio de Janiero -- and upgrade to smarter hotels -- costs could balloon to over $30,000. Economy flights from major U.S. cities to Rio are now priced between $1,200 and $4,200. But many of those cheaper flights include multiple stopovers and travel time of over 24 hours. Fares are rising all the time. Travel website Hopper.com estimates that average prices for flights to Brazil have increased by nearly 40% compared to the same time last year. Once you're there, finding a room is the next challenge. Travel agents are warning that most of Rio is booked solid, though availability in other cities is better. Michael Fine, a travel consultant based in Sao Paulo, estimates typical hotels rooms in Rio will cost between $200 to $500 per night during the World Cup. That compares with an average rate of about $130 per night that Brazilian hotels usually charge in major cities. Those looking for more luxurious living should expect to pay well over $500 per night. Ed Lyne, 26, from London, is among the lucky few who managed to snag a deal in Rio. He and five friends reserved a large apartment near the beach in Rio's Copacabana neighborhood through Airbnb. They're paying roughly $75 per person per night, but they booked in October 2013. "If you [book] in advance, you can do it on a budget. But if you wanted to book now, it would be impossible," he said. Getting game tickets will also take a chunk out of your bank account. According to the official FIFA.com website, tickets for international visitors are priced as low as $90 per game. A few tickets to some matches early in the tournament are still available. A top-tier ticket to the final would have cost nearly $1000, but those are long gone. Even hospitality packages offering tickets to a semi-final and the final sold out a year ago, despite a price tag of $10,600, said sports travel expert Anbritt Stengele. Fans should be ready for the added cost of getting to the games, either via taxis to the stadium or a flight to host cities thousands of miles apart. Hopper.com estimates that flying to watch Japan play its first three games will cost roughly $800. "People have to go in with an open budget. If you're trying to budget for this, it's not your trip," said Stengele. Food and parties shouldn't stretch your finances much further. Street celebrations will offer a cheap source of entertainment. "[There are] plenty of social activities for all different tastes and wallet sizes," said travel consultant Fine. "You can dictate your spending quite easily and eat really well," he said.